1) Add quinoa and broth to a large pot. Bring to a boil, cover and reduce to simmer for 10 – 15 minutes until all the broth as been absorbed. Remove from heat, fluff with a fork and allow to cool while you prepare the remaining ingredients. 2) While the quinoa is cooking, preheat the oven to 400ºF. 3) Toss your diced sweet potatoes (or squash), shallot and garlic in a large bowl. Add spices, salt and pepper, then drizzle with oil and toss to combine. Transfer to a baking sheet and roast for 15 – 20 minutes, flipping half way through. 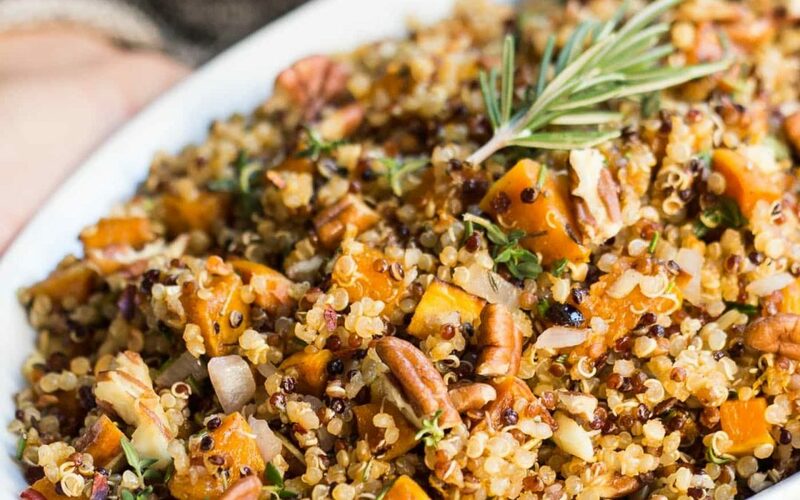 4) Assemble stuffing by combining cooked quinoa, potatoes and pecans in a large mixing bowl. Stir together and add apple cider vinegar, rosemary and thyme. Toss to combine. Taste and adjust seasonings as needed. 5) Serve cold or reheat slightly. Start a new habit now, before the New Year! Billie McCoy on Ideal Weight: The Healing Power of a Healthy Mind Set.